The gravel crunched underfoot as we made our way down the path to the gardens. Surrounded by sugar maples and tall oaks, the canopy above us was aflame with red and yellow leaves. As we rounded a bend in the path a pond appeared and over it a familiar green foot-bridge. Where have I seen that before? The still pond reflected the colors of the trees and plants - a true still life painting. Ah, that's it! Monet's garden bridge over the lily pond - That is why this looks so familiar! I've seen those paintings dozens of times and always loved the soft colors and peaceful setting. No, were not in the south of France. We are at Gibbs Gardens just north of Atlanta, in Ball Ground Georgia. 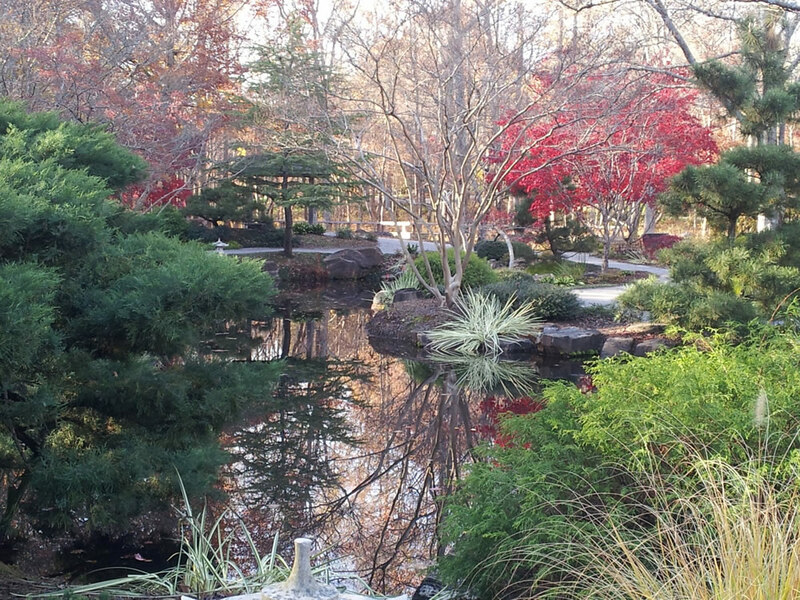 Gibbs Gardens is a hidden gem created by Jim Gibbs - retired president of one of Atlanta's premier landscape companies and a founding member of the Atlanta Botanical Gardens. His landscape designs have won hundreds of awards including two presented at the White House. The gardens spread over 220 acres of rolling terrain that includes a manor house, making it one of the largest residential estate gardens in the country. There are 32 bridges, 24 ponds, 19 waterfalls, and 16 separate gardens to stroll through. One of my favorites is the lovely Monet garden with its moon bridge over a lily pond flanked by weeping willow and a host of lovely water plants. But there is so much more to see and each of the 16 gardens is an "instagram" moment! Although there are plantings year-round that celebrate the natures' finest blooms, the fall at Gibbs Gardens is pretty spectacular. From September through November there are events highlighting each group in bloom. While you can enjoy the fall wildflowers right through November you may want to schedule your visit to see the Monet Waterlily Colorfest that is slated from mid-September through mid-October. If you arrive later, no worries, you'll catch the Japanese Maples Colorfest (and you can still walk over the moon bridge in the Monet garden!). There are a number of events hosted at the gardens. Coming up fast is the Georgia Mountain Beer Festival on October 20th. You can sample more than 20 regional craft brewers and, of course, there will be music, vendors, and food! If you plan your visit in the spring you'll be dazzled by the Daffodil Festival and the Cherry Blossom Colorfest. Or, visit in summer to catch the Rose, Hydrangea, or Rhododendron Colorfests - each a beautiful way to spend a summer's day. Winter is a time of rest for the garden and the gardens close to the public by early December. NOTE: Admission fees for events vary. Please check with Gibbs Gardens website (gibbsgardens.com) for particular event admission pricing. Our favorite campground between Atlanta and Gibbs Gardens is Army Core of Engineers McKinney Campground on Lake Allatoona. It's a great spot on the lake and a very nice campground. (You can make reservations through Recreation.gov/camping/mckinney-campground). It's about an hour from the gardens and about the same to Atlanta. If you prefer a state park campground, Georgia's premier state park. Red Top Mountain State Park, is tucked into the high ground around Lake Allatoona. Lots of hiking trails, a beach, boat launch and ranger programs. The RV campground is situated overlooking the lake and often booked far in advance, so make your reservations early! Red Top Mountain State Park is located about an hours drive from Gibbs Gardens and about an hour north of Atlanta. To help your fall travel planning we have prepared an RV Trip Planning Cheat Sheet and you can get it by clicking here. I hope you enjoy your upcoming fall weekends touring the back roads and mountainsides looking for fall color!